Maca (Lepidium meyenii Walp) is sometimes referred to as Peruvian ginseng because of its similar properties. Dried Maca contains about 59% carbohydrates, 10% protein, 2.2% lipids and a number of sterols, including sitosterol, campestrol, ergosterol, brassicasterol and ergostadienol. It is also a good source of iron, magnesium, calcium, potassium and iodine. 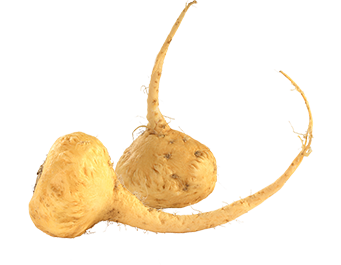 Maca is mostly known for aiding energy and endurance. The key to these effects are two groups of novel compounds called macamides and macaenes. It is not a stimulant; rather, it is a stress-adaptor. As a natural hormone balancer, Maca was used traditionally to enhance sexual function in men and women, to increase fertility and to help alleviate menopause symptoms.